Crawlspace encapsulation, or vapor barriers, protect structures from mold and moisture that enters from the soil beneath. Vented crawlspaces are the alternative but not recommended in Lake Oswego due to their tendency to let moisture in. This is why vapor barriers are necessary for homeowners who want the best protection against foundation breakdown and potential health risks. Northwest Weatherization specializes in the installation of custom vapor barriers for the benefit of your home and your health. We know that encapsulating Pacific Northwest basements is a critical service since the region has high levels of rainfall and radon; both of which cause problems that start in uninsulated crawlspaces. The crawlspace underneath a house is like an unfinished basement; rife with water damage potential. Take early action against moisture problems. A vapor barrier installation protects your home at the ground level. Let us seal your subfloor using superior vapor barrier technology. 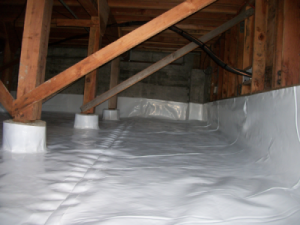 We create an unvented crawl space by spreading a layer of at least 6-millimeter polyethylene plastic on the crawlspace floor to help keep moisture and soil gases from entering. The plastic should be seamless, taped at any breaks and attached and sealed along the perimeter. The EPA warns that 1 in 10 homes in the Northwest is at risk for high radon levels. Radon is not simply a nuisance, it’s strongly linked to lung cancer. Making it doubly problematic is its inability to be detected without a special radon testing kit. This threat is a leading reason why our Lake Oswego customers request installation of vapor barriers. If you’re building a new home or are worried about radon in your existing home, call Northwest Weatherization. We know how to properly fit and install vapor barriers so you don’t have to worry. Mold, moisture, or contaminants building up under your home. Sewage can be washed in after a heavy rain and quickly cause health problems. Building a barrier against vapors keeps toxic substances a safe distance from your home. Furthermore, a barrier will block moisture, which protects your foundation from water damage and mold growth. An environment that promotes mold growth. Mold spores thrive in dark, damp areas around the home, eventually seeping into basements, walls, and flooring. Better to plan ahead to avoid restoration costs. Our barriers stop mold before it starts. Cracked or burst pipes. The area is experiencing more frequent freezing temperatures that can cause pipes to burst. More aggressive insulation effectively regulates the temperatures of basement and crawlspaces. This keeps pipes from failing. Poor energy efficiency. Excess moisture can cause furnaces to kick on more frequently which means a higher electricity bill for you. This can also lead to a furnace replacement sooner than later. Our weatherization services save you money by installing the moisture barrier that works best for the conditions of your home. 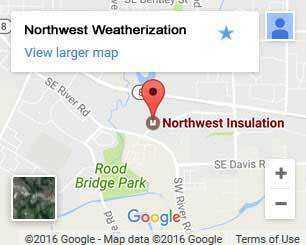 Call for Northwest Weatherization’s low-cost vapor barriers for Lake Oswego homes. Our number one priority is to protect residents from the discomforts and hazards caused by poor insulation. We make it as easy and cost-effective as possible for you to upgrade your home today. Call for a free estimate.